Running events for Every Body & EVERYBODY. Your Fall/WINTER series medals link together. Run all three events and get a 4th medal to link them together. How do you register for the fall series. Simple register for each event and run each event individually. Once you finished each race, you will collect a finisher medal and at the last event on December 30th, we will have your fourth medal if you have the other three to link together. Medal linked together coming soon. Unique race medal will have moving parts ,as well as, magnet together ! 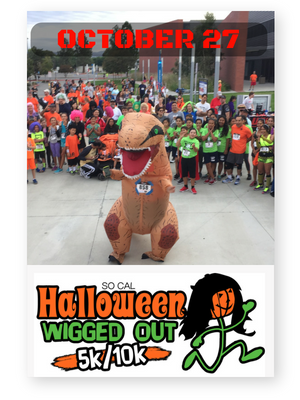 SoCal's Halloween Wigged Out 5k/10k will take place at Bolsa Chica State Beach by lot 25. That is the lot by the Warner and PCH. Santa Claus will be at Huntington Beach. Entrance to state park is by Beach Blvd and PCH. Car fee is $15. Carpool is recommended for all events. Start your New Year's Celebration early with our Run In The New Year's 5k/10k & Half Marathon option. The racewill take place at Bolsa Chica State Beach by lot 25. That is the lot by the Warner and PCH.